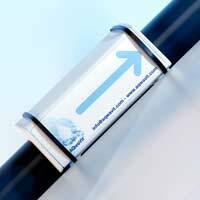 The AQwaVit® Water Vitaliser is placed on the water pipe. The appliance is very simple to install yourself, without the help of a plumber. It is suitable for all types of water (tap, well, rain,…) and all types of pipes (synthetic, copper, steel, pipe within pipe,…). 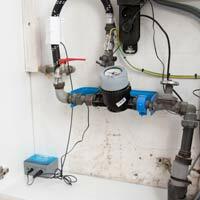 – Just behind the water pump that pumps the rain or well water. – On the water system that is used to cook, bathe or shower. – on the pipe after the water descaler. If you have any questions about the ideal place for your AQwaVit® Water Vitaliser, please get in contact with us. Install the induction unit with the provided tie wraps on the water pipe, directly after the water meter or water pump, and in such a way that it fits the pipe completely. The side of the cable attachment should be on the side where the water enters. Then fit the cable of the induction unit to the control unit, in the appropriate connection. Place the power cable into the power unit and the plug into the socket. The green LED lamp should begin to blink and should continue to do so. Everything is working now. If the green LED lamp does not blink, remove the plug from the socket, wait for 20 seconds and place it back into the socket. 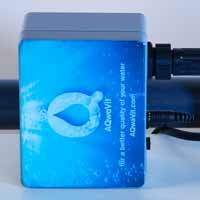 Your AQwaVit® Water Vitaliser is now ready for use. Allow sufficient water to flow through the entire water system until it is filled with the new vitalized water and then taste it.